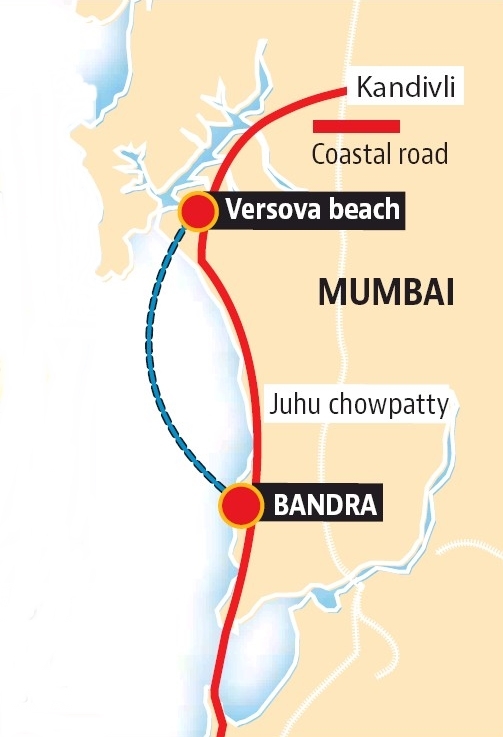 Motorists will be able to zip from Worli to Versova in less than 15 minutes by 2023 as the work on the city’s second sea link is slated to start in a few months. The 9.8-km sea link, which will connect the Bandra-end of the 5.6-km Bandra-Worli Sea Link and Versova, will be constructed by a consortium of Reliance Infrastructure Ltd and an Italian company Astaldi SpA. The construction of the sea link, which is estimated to cost ₹6,993.99 crore, will be completed in 60 months, Reliance Infra said. Maharashtra State Road Development Corporation – the implementing agency of the project – issued a letter of acceptance to the consortium last week. 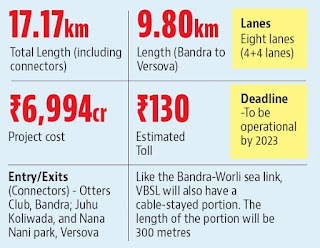 MSRDC officials said that the construction of the sea link will save travel time between Bandra and Versova by 10 minutes. A senior MSRDC official said that the actual construction on the project will commence in six months. However, motorists will have to pay a minimum toll of ₹130 to travel on the VBSL. Collectively, the ride through BWSL and VBSL is expected to cost motorists ₹250. VBSL will also have a 300-m long cable-stayed section, similar to the BWSL. 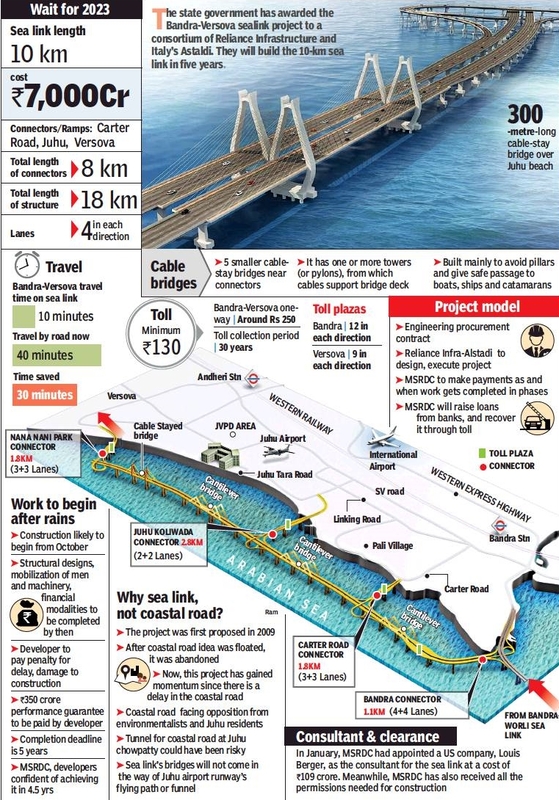 As per Reliance Infra, the cable-stayed portion will be towards the Versova-end of the sea link. 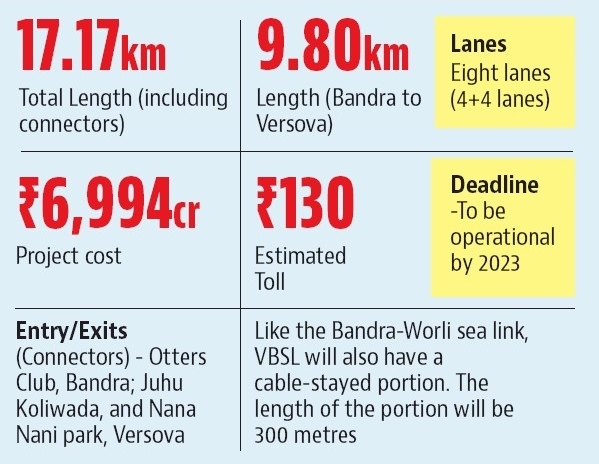 The sea link will have three connectors-- one at Otter’s Club, Bandra; second at Juhu Koliwada and the third at Nana Nani Park at Versova—which would take the total length of the sea link to 17.17 km. 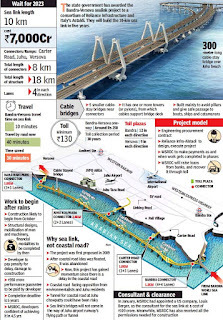 The sea link is a crucial component of the coastal road project, which envisages connecting south Mumbai and the western suburbs by a series of reclaimed roads, tunnels and a sea links. R L Mopalwar, vice chairman and managing director, MSRDC, said that the agency has secured all the requisite environment clearances.